Mac’s house is solid brick, except for the sunroom addition. The antique-wash brick is actually beautiful and doesn’t have that pristine finish I don’t like. The brick is fine. The curb appeal is not. It wasn’t hard to drive by Mac’s and be completely underwhelmed by the exterior appearance. 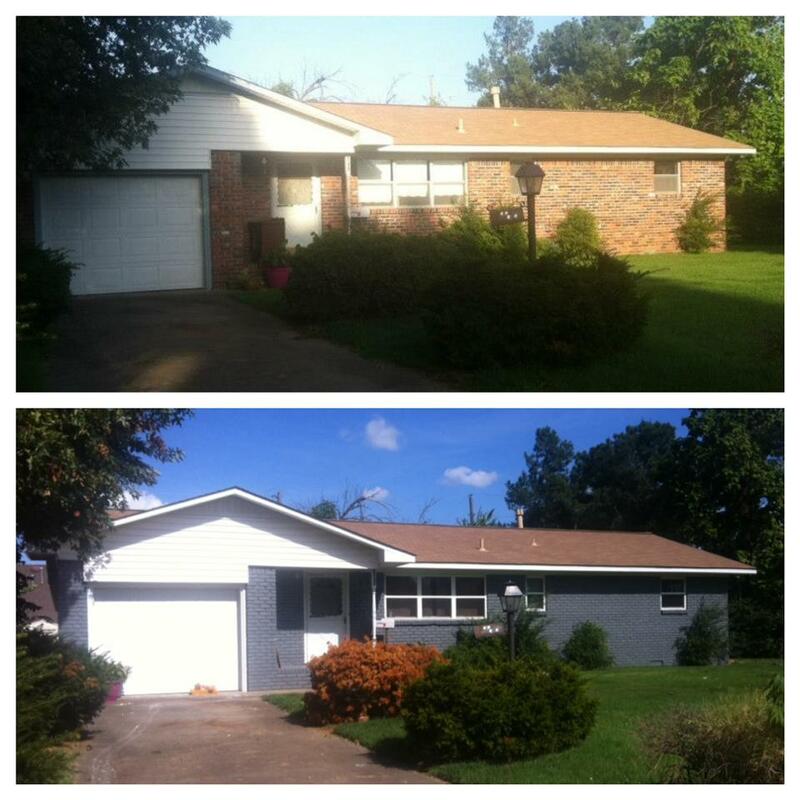 In previous flips, I’ve been fortunate that I have only had to do minor curb appeal changes. 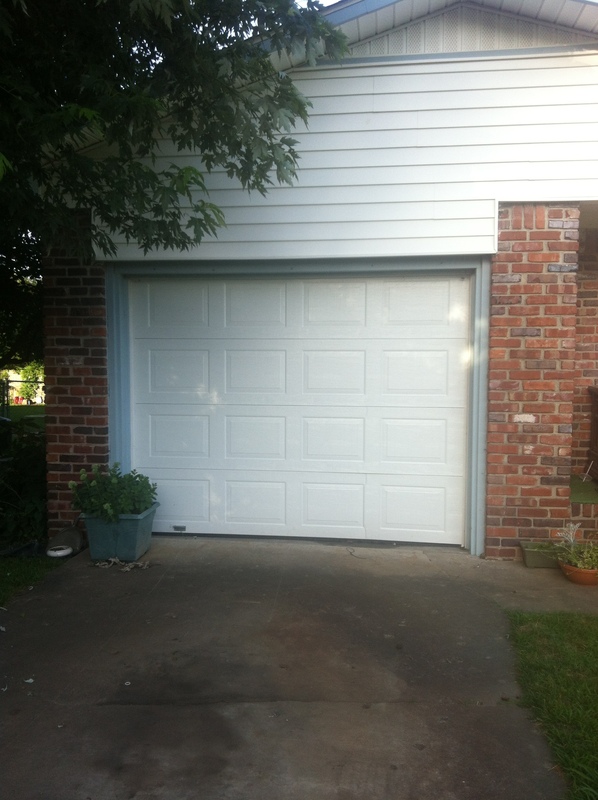 The siding above the garage and surrounding the sunroom is white, but the trim is done in a light, country blue siding. I wasn’t a fan. I think that particular shade of blue dated the exterior appearance. Due to the huge, overgrown trees and the bland brick, the house was dark and nothing seemed to pop. The very first step in the house flipping process happened almost immediately: painting the exterior. While this could easily be a DIY project, I didn’t have the confidence or time to tackle such an enormous project. 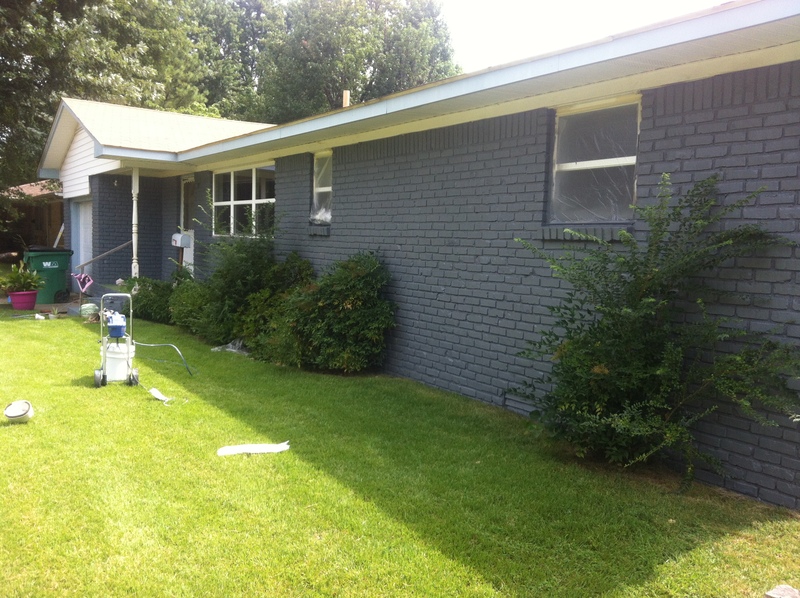 In effort to modernize the exterior, I chose a gray paint color. 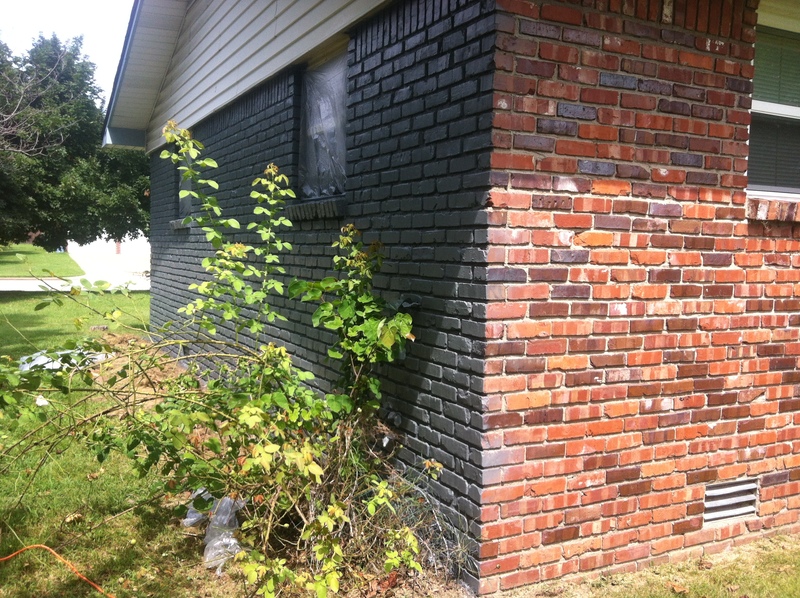 The paint is Almost Charcoal from Valspar. 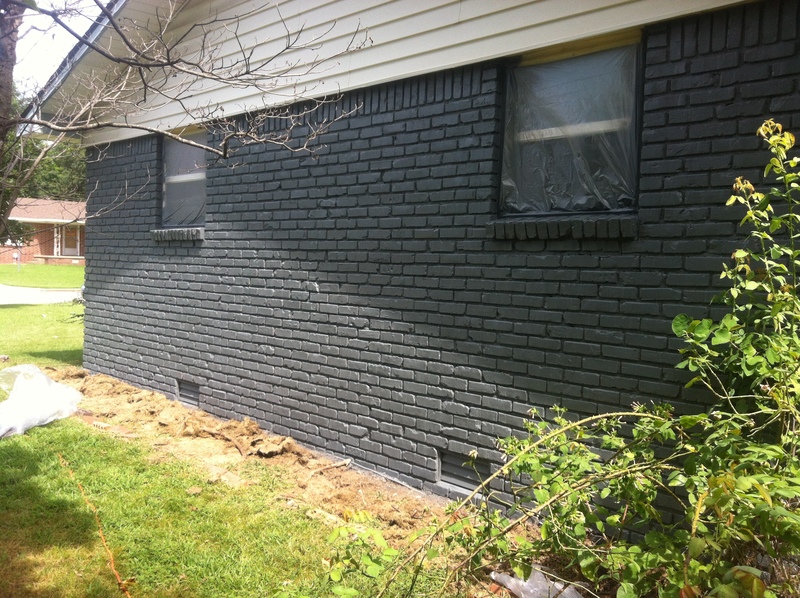 It’s a dark gray–possibly too dark for an interior, but it’s perfect on the exterior. I hired a professional painter and it took him about a week with some weather delays. He actually didn’t have to prime the brick before painting because the paint had primer mixed and he did three coats of paint I believe. In my house flipping experience, I have learned some investments have a bigger bang for your buck…paint is always one of them. Especially on the exterior! It was a dramatic change! 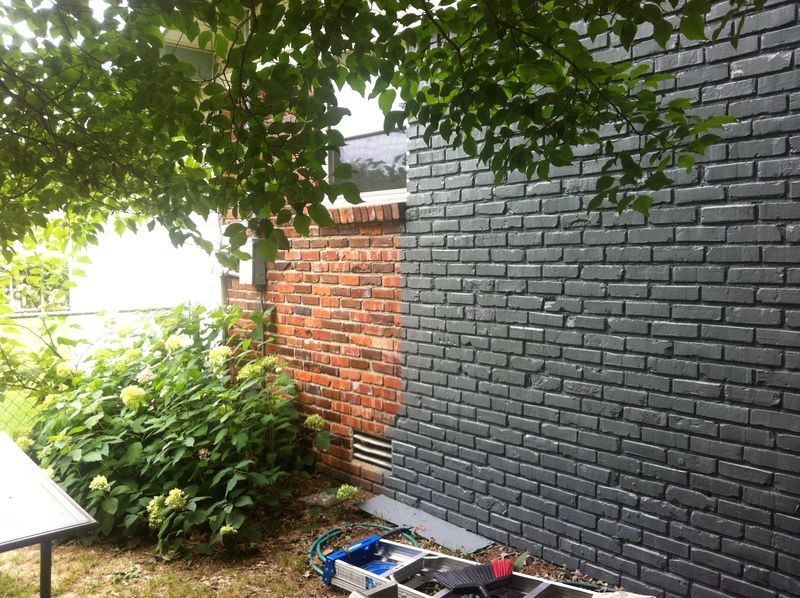 He not only painted the brick, he also painted the siding. I didn’t even know you could do that! All of the blue trim was painted a crisp white. After seeing the first coat of paint, I LOVED it! Except for the front porch. I already had plans to remove the decaying, dirty green carpet, but I hadn’t thought to do that prior to painting. 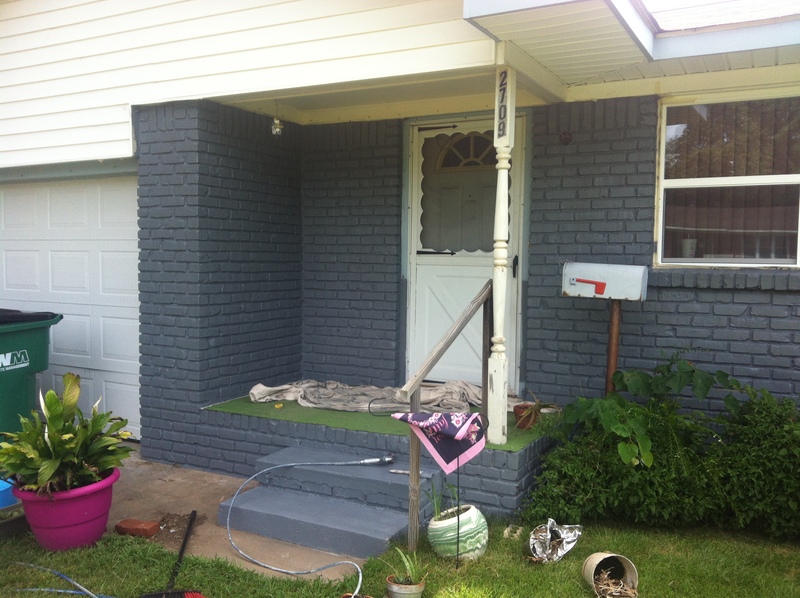 So, instead of waiting, I removed the carpet and had the painter paint the porch as well. The dark gray paired with the crisp white looks so modern, and the house appearance has dramatically changed. I had several neighbors stop and comment about how dramatic of a change. My only struggle with the paint process was trying to match the paint to the shingles. The roof is new and it’s a mixture of tan and burnt orange shingles- not the most ideal color. I chose dark gray even though I didn’t love it. 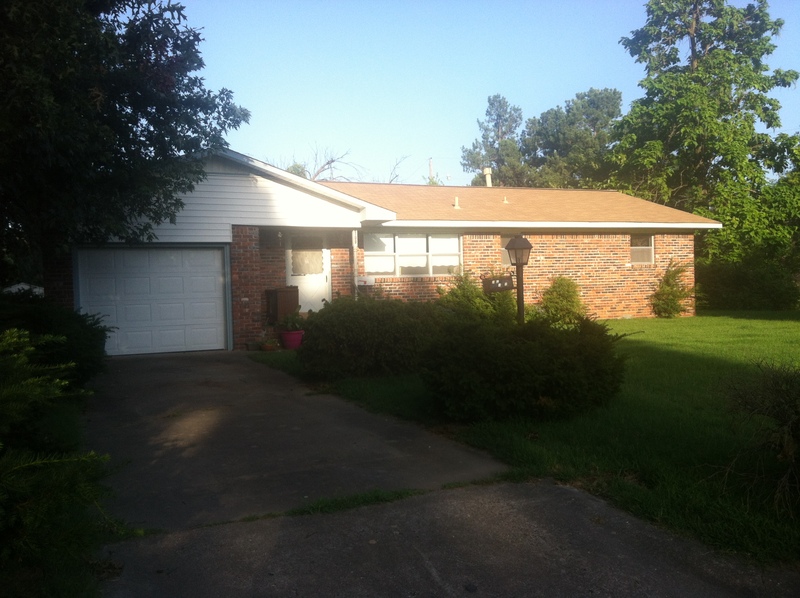 I don’t think they match perfectly–not even close, but I won’t complain about an almost-new roof. After the paint, and really no other changes, I’m already in love! Those green, overgrown shrubs just pop in color! 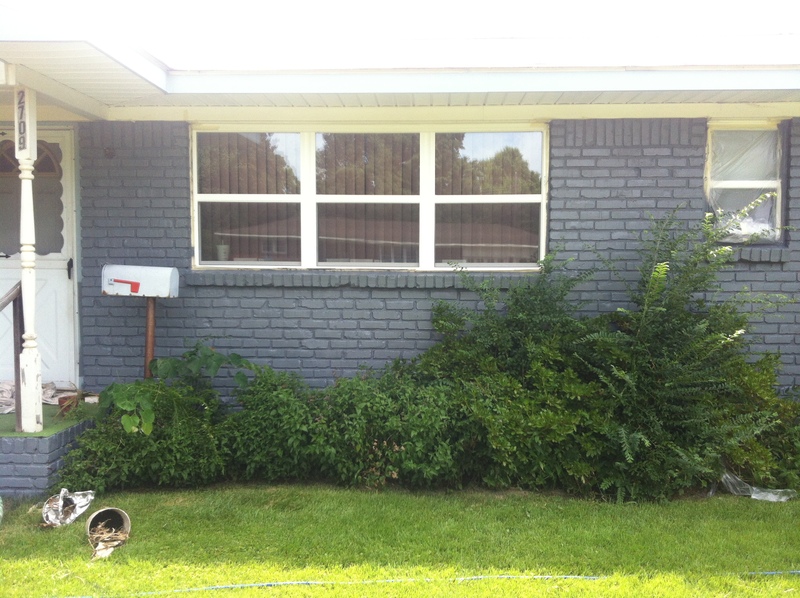 I can’t wait to get started on that delinquent flower bed and add some annuals and color. Like I said, I could have tackled this project myself, but it would have taken a lot more time, and I’m certain it would not look near as good. For a little over $1,000, a gigantic change was made in the curb appeal at Mac’s. 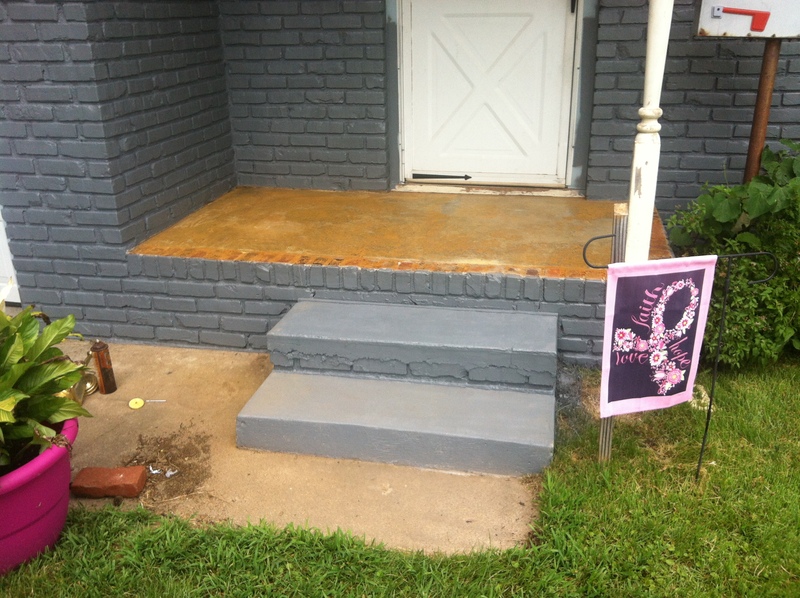 How did the paint hold up on the floor of the porch and the steps now that it has been in use??? It has actually held up really well. There are 3 baseball size spots I’ll have to touch up– one of my crews spilled chemicals on it and didn’t attempt to clean so it eroded the paint that was there. Besides that, look great! Linda- Your comment will be deleted b/c you failed to read the only requirement I have for commenting: be positive. I need my readers to know I do NOT blog to ask what YOU would have done- as it is entirely irrelevant to me. You will need to find a different forum for your negative comments as they are not welcomed and will be blocked in the future. Oh how I love this look! I would love to have my brick painted gray but we have green siding also. This would not look good without painting the siding white. My question is: Is there a special type of paint that has to be used for the vinyl siding? Thank you, I’ll look into that solution. I LOVE the gray!! Absolutely beautiful and makes such a difference.